A pretty French bureau in the style of Louis XVI catches my eye. The late afternoon sun burnishes it’s elegant walnut timber and coaxes the inlay of fruit woods into startling contrast. Ormolu, in subdued gold, decorates the graceful cabriole legs. I open the lid and gently lower it. The interior is beautiful. It contains set of three draws and two cunningly concealed compartments underneath: A place to secrete a letter d’amour perhaps? “Hello. May I help you?” Startled, I turn to see a slender young man standing behind me. Dark curly hair falls over his forehead exaggerating the blueness of his eyes. He gestures to the bureau and says: “Second Empire circa 1870. Beautiful, non?” The accent is French. I nod an affirmative. He continues: “It’s just been returned to the store. Madame found it did not agree with her.” A curious use of the English, I think, almost as if the desk had, in someway, made her ill.
With my curiosity aroused, I ask: “She found it’s style didn’t suit her house?” His eyes dance: “I do not know. Perhaps that is the reason.” His response is delivered with an expressive shrug. I sense he is being evasive. My fingers glide over the intricate inlay of woods which depict a cornucopia of flowers and fruit, then down the slender curve of the cabriole legs. I examine with interest the ormolu. It’s the face of a beautiful woman and not the usual offerings of cherubs, angels or Medusa heads. There is a feeling of sensuality when touching a quality piece of furniture. Suddenly I realize, despite my parlous financial situation I must have it. It was about two weeks after the purchase of the desk I began to notice some peculiar and unexplained incidents. At first, I thought my absentmindedness the culprit. I would find the shutters opened when I felt sure I had closed them or conversely closed when I was equally sure I hade left them open. Interestingly, it was only the shutters in close proximity to the desk affected: Those by the French doors. Beau took to lying on the sofa furthest from the bureau and staring balefully at it. The hairs on the back of neck would rise when he started to growl for, moments later, the scent of roses would fill the room, almost as if someone had come into it wearing an intoxicating perfume. The lamp on top of the desk would flicker alarmingly, its illumination first growing very bright and then fading to a murky yellow. Could it just be the less than efficient but eco-friendly bulbs we’re now forced to use? Then one day, quite by accident, I found a secret compartment hidden behind the middle draw. With exploratory fingers, I reached into it’s furthest recesses and pulled forth a letter, delicate with age and much rumpled, as if it had been pushed with haste into the hidden aperture and forgotten. With mounting excitement, I carefully smoothed the letter flat. The writing was in French, making it impossible for me to read without the help of French/English dictionary. As I laboured to understand the letters brief contents, an oppressive sense of melancholia envelopes me and the scent of roses again become cloyingly evident. The letter was addressed to Niccha and its contents almost indecipherable. Watermarks or perhaps tears blurred the ink. It was a love letter telling her goodbye and of anguish at having to say so. A standard, common garden variety sort of “dear John” letter, it would appear. Today, such news would doubtlessly delivered by a text message. As I lift the letter to the light to see better the name of the sender, it begins to disintegrate – to break into small pieces – and, as they fall to the floor, a sudden breeze sweeps the sitting room causing the pictures on the wall to tremble. For a moment, I am transfixed. I watch the remains of the letter dance like snowflakes before being swept towards the open door. Then, bang, the door slams shut. The letter is dispersed to the four winds. In the sitting room, an absolute silence descends. The scent of roses has gone. I look at my hand. I still hold a piece of the letter and on it is the name Louis Napoléon. I was keen to explore further, to find the owner of the letter, curiosity being a vulgar but powerful motivator. The internet search engine, Google revealed nothing of interest when I searched the name Niccha but, as I suspected the name Louis Napoléon produced a plethora of information and the possible indentity of Niccha. 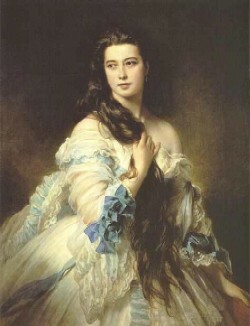 Niccha was more famously known as Virginia Oldini, The Contessa di Castiglione and as a courtesan of the second Empire. 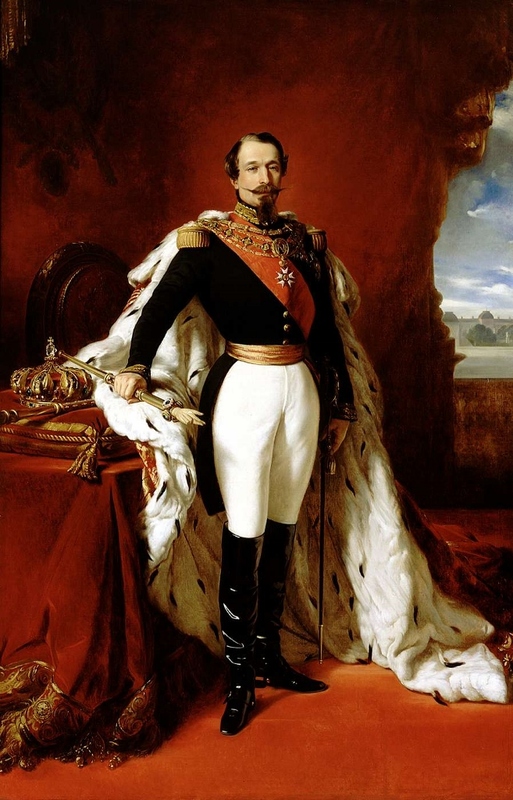 She possessed great beauty and immediately caught the attention of Napoléon III ( Louis Napoléon ). They became lovers but the tumultuous politics of the day came between them and Niccha was deported back to her native Tuscany after being accused of spying. She returned to Paris years later and lived in splendid isolation, mourning the loss of Louis Napoléon. Her apartment in the Place Vendome was decorated in funeral black and perfumed by masses of roses, the shutters kept closed and mirrors banished – apparently so she would not have to witness her advancing age and the loss of her incredible beauty. Could she be the owner of the letter and therefore the bureau? The face depicted in ormolu, decorating the desk bears an uncanny resemblance to the portrait of Niccha. The inexplicable smell of roses and Beau’s reluctance to be in close proximity to the bureau may suggest a phenomenon not quite of this world. Curiously, since the discovery of the letter, the disturbances have ceased. As I sit at the desk and write this blog. I’m caused to wonder if it was merely my fevered imagination at work or there had been some sort of lingering energy attached to the bureau – an energy dispersed with the discovery of the letter.